This year my Mr Munchies actually requested a cake for his birthday. It’s totally not like him, he usually leaves it up to me to decide. I guess he was really feeling for cheesecake. ‘Just any cheesecake’, he said. Me? 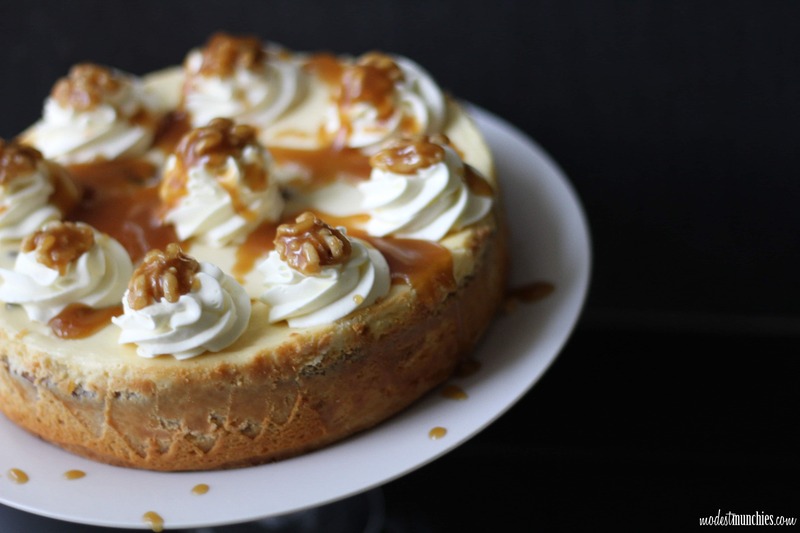 Make ‘just any cheesecake’? Sorry hubby… Just kidding, I’m not sorry, this cheesecake is too good for me to be sorry, and trust me there were no complaints. Make the base as per instructions on the website. Line the bottom and sides of a springform pan (21cm) with baking paper. I filled my base up the 3/4 of the way up the sides and still had some extra left over. Bake prior to filling with cheesecake. Pre-heat oven to 150c. Beat cream cheese and sugar until it is smooth. Add vanilla essence, eggs and cream. Beat till smooth and creamy. Pit and chop dates roughly and fold through the cream cheese mixture. Pour into pre-baked tart base. Bake for 50-55 minutes or until the cheesecake seems firm with a slight wobble in the middle. Leave out to cool, chill in the fridge for an hour. Place a small pan on medium heat on the stove. Put in the butter and sugar and cook until sugar has dissolved. Once dissolved pour in the cream and set aside. The sauce will thicken as it cools. 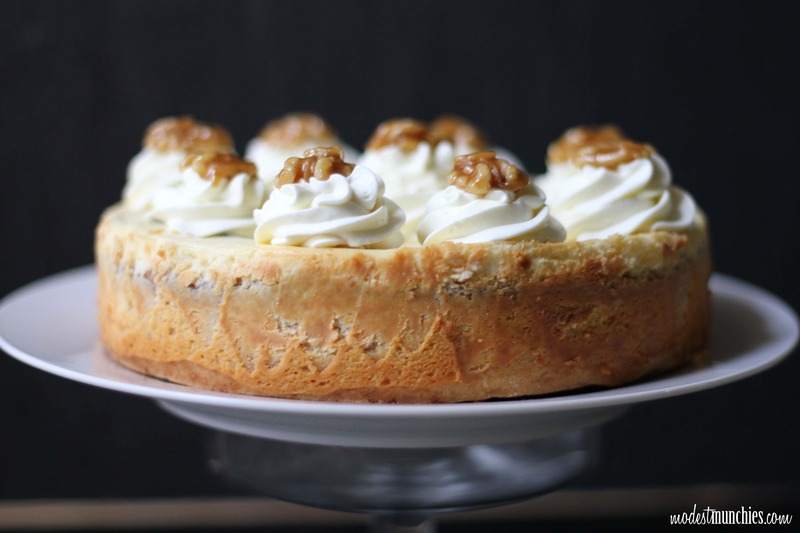 Tips for a perfect cheesecake Tap the cheesecake on the table to remove air bubbles. Place a dish of water in the oven while the cheesecake is baking. This makes for a smooth cheesecake without cracks. Edit: After having someone test my recipe, it came to my attention that I didn't include a pan size, which can affect the cooking time and texture. So I have updated that above. Also, every time I make this cheesecake the texture is different. Sometimes runny, sometimes thick. It depends on the fat content in the cream cheese as well as how soft the cream cheese is when I beat it. If you a have this problem, don't despair, whichever way it is runny or thick, it will still work and still be delicious. Loving the shots I’m getting with my new camera. Mr Munchies gave me a camera for my birthday this year, it is am-a-a-a-a-zing! I’ll be posting another recipe from his birthday soon. This was the cheesecake pre butterscotch drizzle. 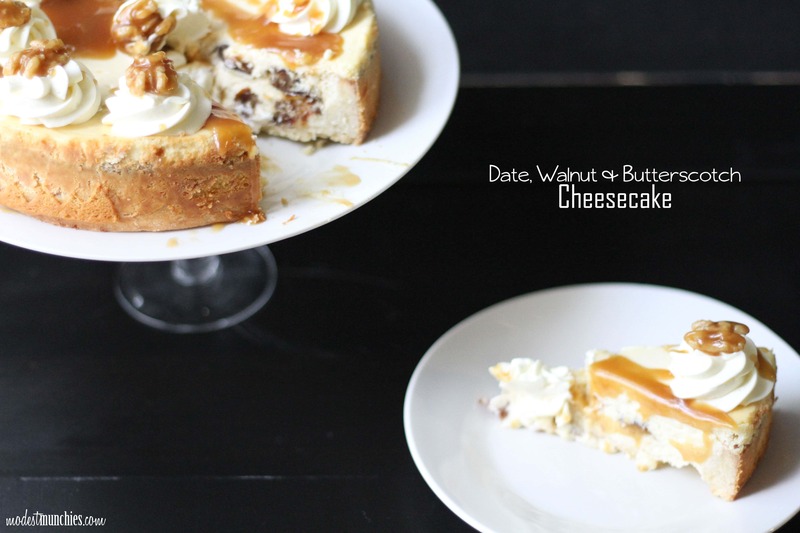 Loved it… hands down best cheesecake ever! Pics look awesome! This cheesecake looks marvelous mA! I usually have a hard time with cheesecakes because mine always seem to crack in the middle (maybe from overbeating? Who knows?!). Love that last shot! Thank you! Will pass the message on. Did you read my tips at the bottom of the recipe? They really work for ensuring you don’t get cracks. Hope they can help you in the future.